Bethesda Softworks has announced the latest expansion for The Elder Scrolls Online. The Elder Scrolls Online: Elsweyr is coming on June 4, 2019 for Xbox One and PlayStation 4 with PC, Mac early access starting May 20. Bethesda Softworks has also released the details and announce trailer for the expansion, which you can check out below. As always, each release will feature an incredible stand-alone story, but the Season of the Dragon brings it all together as part of an epic adventure that runs throughout the entire year – a first for The Elder Scrolls Online! The Dragons have returned to Tamriel. Unleashed upon the world by the unwitting Abnur Tharn and the Imperial usurper queen Euraxia, the great Kaalgrontiid and his followers hunt from the skies and threaten to burn down the ancestral home of the Khajiit. 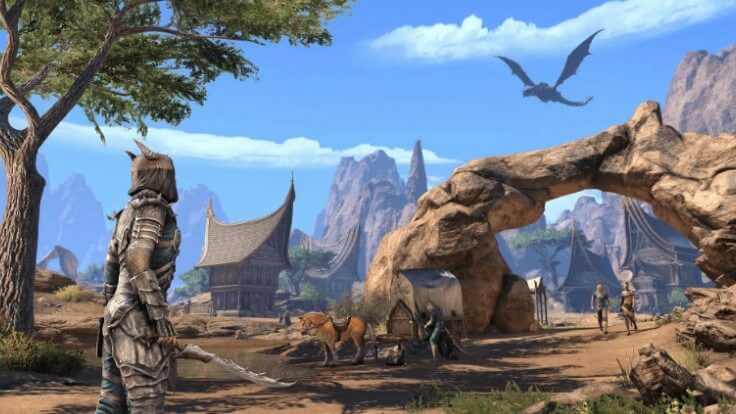 Previously, you have been able to explore the province of Elsweyr in The Elder Scrolls: Arena and its outer edges in ESO’s regions of Reaper’s March and Khenarthi’s Roost, but in this new adventure, you can fully experience the home of Tamriel’s beloved cat people. In Elsweyr, you can traverse both fertile grasslands and scorching deserts, interact with moon-sugar farmers and wandering nomads, or confront merciless Imperial occupiers and roaming bandits. In this new Chapter, you can truly dive into the life, history, culture, and mythology of the Khajiit and their homeland. Of course, in addition to exploring this new zone, you’ll also be called upon to defend the Khajiiti people against a devastating new threat: Dragons. However, in this Chapter you’re no Dragonborn, and you’ll need to work with your fellow players and powerful allies in order to take these winged beasts down. Finally, Elsweyr also introduces the highly anticipated Necromancer Class to ESO. With this dark, mysterious new Class, you will be able to command the dead and cast powerful elemental spells to overcome your foes and bolster your defenses. With the Necromancer, death itself is a weapon!"